Five Star Seafoods is renowned for excellence in the quality of the Southern Rock Lobster it provides to its customers overseas. This reputation for quality is built on the skill of Five Star’s fishermen and the pristine and cold environment of the Southern Ocean where the live lobsters are caught. The Five Star export facility is based at Port MacDonnell, South Australia. Port MacDonnell is the home to the largest Southern Rock Lobster fishing fleet in Australia. The Southern Rock Lobster is highly prized and the most sought after lobster in the world. Five Star Seafoods is accredited to export to predominantly Asia including; China, Hong Kong, Macau, Taiwan, Singapore, Malaysia, Thailand, Vietnam, Indonesia and the Middle East. The company’s export accreditation is managed and audited by strict Australian compliance guidelines. Australian law supports the production of safe foods and ensures that all food exported complies with Australian Food Standards (HACCP) and additional importing country requirements for compliance including; traceability, sustainability and Occupation, Health and Safety. The Department of Agriculture regulates and provides oversight at various points throughout the export supply chain. The Southern Rock Lobster (Jasus edwardsii) is wild caught from the Southern Ocean, found off the coast of South Australia, Victoria, Western Australia and New Zealand. The Southern Rock Lobster has a superb taste and texture due to the nutrient-rich, cold, pristine waters of the Southern Ocean. The slow-growing lobster species has a sweet, delicate but firm white flesh, which makes it perfect for sashimi. 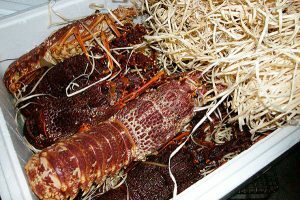 Five Star exports live, frozen cooked/raw whole lobster and frozen raw tails. The fishery is underpinned by stringent catching and handling regulations and catch quota policy. A system of limited licenses, boats and pot numbers avoid over fishing and returns undersized lobsters to the sea. All fishing vessels are equipped tanks that have pumps that circulates sea water to keep the lobster in top condition. The Australian Southern Rock Lobster Industry exports approximately 4,000 tonnes of product annually via air freight to many destinations around the world. Once unloaded from the fishing vessels the live lobsters are placed into refrigerated sea-water held at 10-12°C, slowing the metabolism and prevents stress of the lobster. When exported the live lobster are packed with insulation and ice-packs into polystyrene boxes sealed with tape. When they land into their destination, the importer re-tanks the live lobster back into refrigerated saltwater. Five Star Seafoods exports lobster via air freighted from Melbourne Airport.